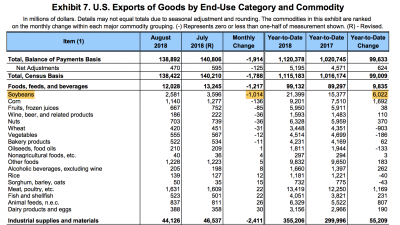 Today’s update looks briefly at recent reports that discuss variables associated with U.S. soybean exports. 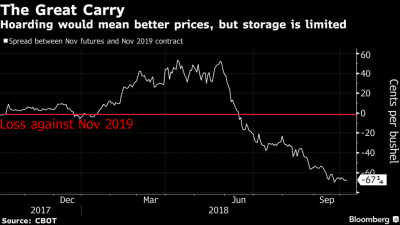 In addition, news items that highlight concerns about crop storage issues, and the trade policy outlook, are also noted. The October edition of the Agricultural Market Information System (AMIS) Market Monitor stated that, “For fifteen years, US farmers have responded to China’s inexorable demand for soybeans by nearly doubling their output of the oilseed, even as other countries eagerly joined the soybean production race. While the flow of US soybean sales to China reached about 36 million tonnes in 2016/17, today it has nearly halted. 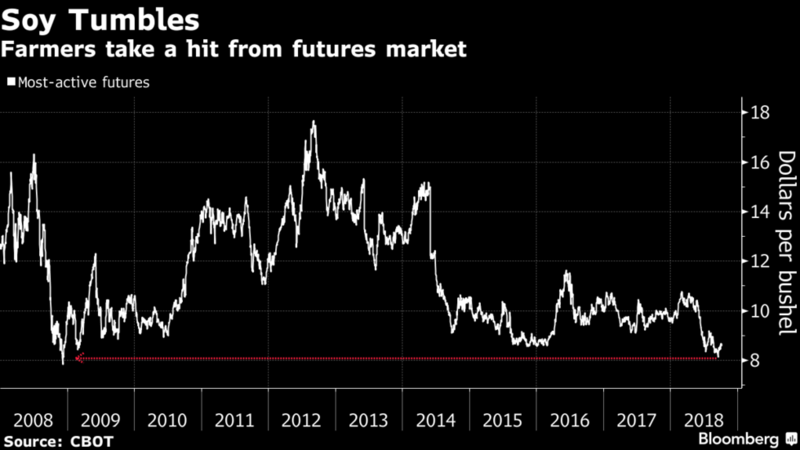 “These Charts Show How Soy Farmers Are Paying the Trade-War Bill,” by Isis Almeida. 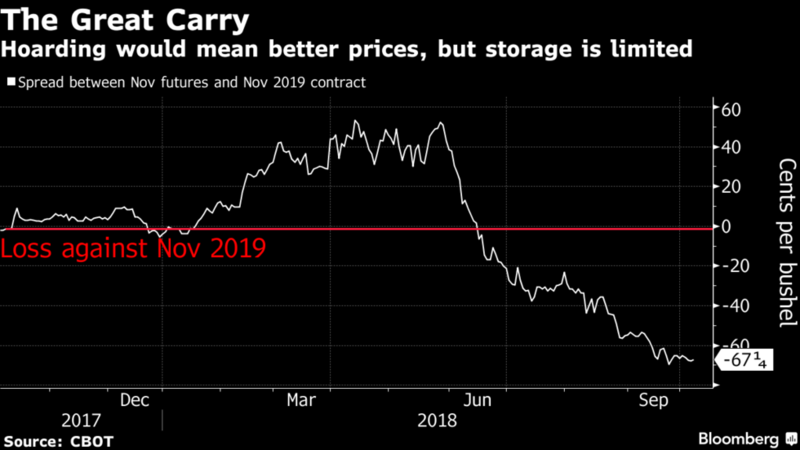 Bloomberg News (October 5, 2018) https://goo.gl/yUHWfd. and the carrying charge from this November to next has reached a record wide number. 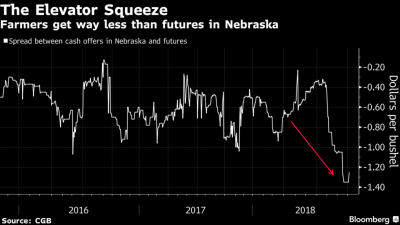 In other words, US producers selling soybeans during this fall period are certain to make distressed sales. AMIS, Market Monitor (No. 62 – October 2018). Brazil: Oilseeds and Products Update- Record Production and Trade Forecast Amid Favorable Trade Environment. USDA- Foreign Agricultural Service. GAIN Report Number: BR1816 (September 28, 2018). 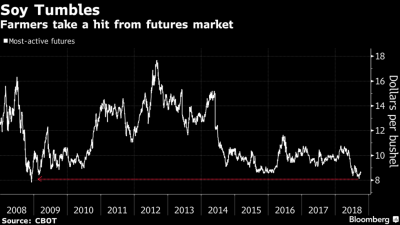 “Soybean exports dropped $1 billion, or 28 percent, to $2.58 billion, reversing a run-up earlier this year ahead of retaliatory levies from China,” the article said. 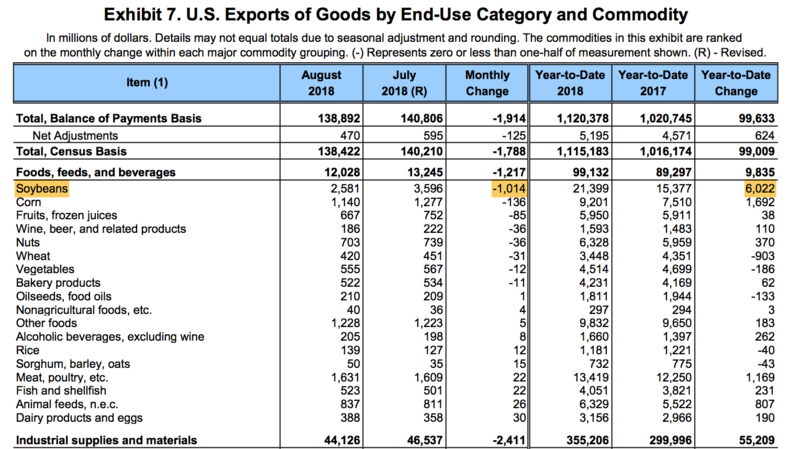 Monthly U.S. International Trade In Goods and Services, August 2018. U.S. Census Bureau and the U.S. Bureau of Economic Analysis (October 5, 2018) https://goo.gl/egKtsP. 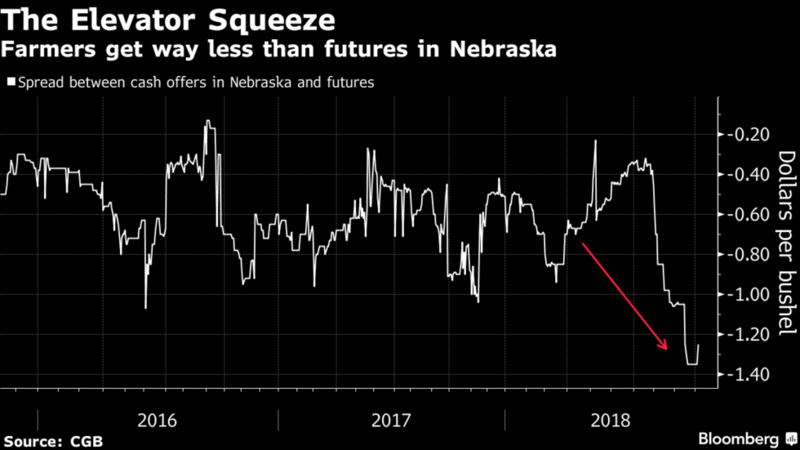 David Fickling indicated last week at Bloomberg News that, “Across the U.S. Midwest, farmers are taking in their annual harvests of corn, soybeans and sorghum. This year, they have a special problem: Where to put it all? The article noted that, “At a rally in Minnesota on Thursday night, Mr. Trump argued that his ‘America First’ policies are paying off for farmers and workers. ‘We have removed unfair trade barriers for our proud Minnesota farmers and our dairy producers like has never, ever been done before in our country,’ he said.